After decades of raising the motherless Smith children, housekeeper Emma Thatcher is faced with resentment when she marries their father. Out of jail for a crime she did not commit, Madelon turns to prostitution and thievery to send her illegitimate son to medical school. Based on Sinclair Lewis's novel "Arrowsmith". A medical researcher is sent to a plague outbreak, where he has to decide priorities for the use of a vaccine. A contained cast of characters traveling aboard a transatlantic ocean liner are pushed to dangerous limits though monetary issues that threaten the lives of the people onboard. Min, the owner of a dockside hotel, is forced to make difficult decisions about the future of Nancy, the young woman she took in as an infant. A Creditor: Your own mother might not know you. Your own wife might not know you. And you might put on all the uniforms and all the whiskers and all the wigs in the world. But, as long as you owe me money, I would know you. 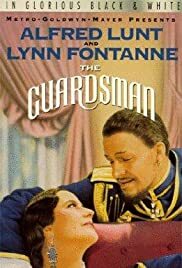 Although Alfred Lunt and Lynne Fontanne did do several television plays that have been recorded for posterity, The Guardsman represents the only sound filmed record we have of them at the height of their fame as America's leading thespian couple. Years ago I read a joint biography of the Lunts and the two of them felt quite strongly that live performance was the only true test of acting ability. They also felt it was important to bring theater out to the hinterlands. Rather than be on a sound stage in Hollywood, the Lunts made many road show tours of their Broadway hits and other plays in a tremendous amount of small theaters. The problem for posterity is that those who remember seeing the Lunts on stage are getting older and fewer. No doubt they took The Guardsman on the road after its 248 performance Broadway run in 1924-25. Given their aversion to film, it's a wonder that Irving Thalberg got them at all for a film. This work has a play within a play, in fact the inner play in this is Maxwell Anderson's The Private Lives Of Elizabeth And Essex. It opens with the Lunts doing the final scene from that work and to tumultuous applause as the curtain closes, we find these two bickering incessantly as Alfred is almost insanely jealous of every attention his wife receives from admirers. What to do? So poor Alfred hatches a cockeyed scheme where with heavy makeup and costume he makes himself out to be a Russian Cossack guardsman who is quite willing to ignore marital conventions for the pleasures that Lynn can offer him. And he puts on a big campaign to win Lynn away from himself. Ferenc Molnar's play was remade by MGM ten years later in The Chocolate Soldier which was the operetta within the play as Nelson Eddy and Rise Stevens played the roles the Lunts originated. The prose of Maxwell Anderson is replaced by the songs of Oscar Strauss from his operetta The Chocolate Soldier. But Molnar's The Guardsman plot remains the same. The play was a tour de force for the Lunts and I don't think it was an accident that the Academy gave its only recognition of this film with Oscar nominations for Alfred and Lynne as Best Actor and Best Actress. It really is quite the personal vehicle. By the way Herman Bing has a small role as a creditor who is trying to get a bill paid from Alfred. In the end he really deflates the pretentious Lunt and you have to see how he does it. One of the other items there is a filmed record of is a Hallmark Hall of Fame production Yankee From Olympus that the Lunts did live for television in the Sixties. It's very good and I did do a user comment on it. But for a chance to see the Lunts at their height, The Guardsman is the one and only vehicle for that.